Let’s kick this off with a classic Disney film, since I’ve been programmed from birth to associate the corporation with happiness. A movie that I would consider one of the greatest achievements of Disney animation, specifically for young children, is Peter Pan. Starting with the surface value aspects: it’s a comical, colorful journey in a magical imaginary land with flying fairies and children dressed in rabbit-eared coveralls. The whole story is about what it means to be a kid, which, as a kid, you’d never really consider or appreciate; but you’d enjoy watching a movie about it the same. The thing that really sells this for me over other Disney cartoons is its lack of severity. Captain Hook thinks of himself as a tyrant and a menace to justice, but he’s actually a pretty big goof, constantly being chased around by an alligator (who had a clock in his stomach for a reason I don’t remember). For older kids, the more threatening villains of Scar and Jafar of Disney films that came out in my lifetime might present a more legitimate story—but for toddlerhood, I think a comical, non-scary villain will do just fine. There’s too much to say about Charlotte’s Web to do it justice in a short summation. It is rife with depth. It’s at once about friendship, identity, mortality, responsibility, growth, time and the circle of life (but it’s not all in your face about it like some movies I know). The complexity of the themes and the plot, which is more or less episodic teamed with a sort of archaic, rural vernacular used by the majority of the characters (or maybe that’s just the Long Island snob in me talking) did keep me from a complete understanding of what was going on throughout the movie. But as a kid, I wasn’t so hung up on following every detail. The likability of each of the characters, especially Paul Lynde‘s snide derelict,Templeton the rat, and the triumphantly catchy songs were enough to convince me to watch this movie on a weekly basis. This is one of those kids’ movies that was like a freaking acid trip. A couple of children get teleported to a mountain after chasing a couple of bears, or gremlins, or something—there were fairies and creatures and insane colors and people singing…it was a pretty wild adventure. But I remember it being ample entertainment. The film culminates with an allegory about a rabbit transforming into a “goon” as punishment for unkind behavior, which provokes the following wordplay delivered by a Boston Brahmin owl: “Hare today, goon tomorrow!” Now, as a kid, I had no idea why the entire cast broke out laughing when he said. But as a young adult, I finally understand. Comic genius. It’s really hard to take a definitively positive stance on Care Bears. The films were not particularly well-written or fertile with any sort of artistic merit. Personally, they didn’t leave as lasting an impression on me as did the other movies I’ve listed here. But, when it comes right down to it, they’re nice. They’re simply about the value of love. Happiness. Kindness. Caring. And I guess, in principle, I don’t particularly oppose any of those things. It’s good to instill morality in children—even you are beating them over the head with it like this movie is. But truly, The Care Bears Movie and each of its sequels are a decent watch for children. They’re certainly better than the other extreme, anyway. I recently tried to impart Sesame Street onto my nine month-old nephew (which might make up for having read him the first chapter of Fear & Loathing on the Campaign Trail). He took to the show pretty well—I think the focus was on the letter ‘G’. Did you know they’re still doing letters? And you know what else? Maria is still on the show! What a trooper. But I digress. Follow That Bird is the tops. Familiar, beloved characters stepping out of their ordinary setting to take on a more exciting adventure—I think that’s what makes an epic childhood movie. For those unfamiliar, Big Bird is relocated to a family of birds somewhere out in the boondocks by an antagonistic but generally well-intentioned social worker who deems Sesame Street an unfit home for BB, due to his lack of bird companions. I do remember struggling with the idea that Big Bird doesn’t have a literal family of his own—which is pretty heavily what the plot was about—which conjured up some solemn wonderings on what might have happened to them. But this passes pretty early on, as there’s a ton of funny stuff going on with all of the Sesame Street residents, who take to the road in a It’s a Mad, Mad, Mad, Mad World style to bring Big Bird home. There’s also a tangential plot wherein a couple of sleazy carnival-runners kidnap Big Bird to use him in an act—but the bad guys here are way too goofy to be threatening in any way. The best part about this movie, which I found out while doing research for this article: one of the two “bad guys” was played by Uncle Trevor from Arrested Development, which I guess makes this movie…for Birdish eyes onlyyy! Roger Ebert has called this one of his all-time favorite movies. I don’t know if that validates anything, but it can’t hurt. Maybe it can… forget I brought it up. My Neighbor Totoro is a Japanese film about two young sisters’ friendships with woodland sprites. It has been genuinely revered by pretty much every movie critic out there since its release in 1993; all of whom seem to praise especially the authenticity of the two girls, aged approximately ten and four. 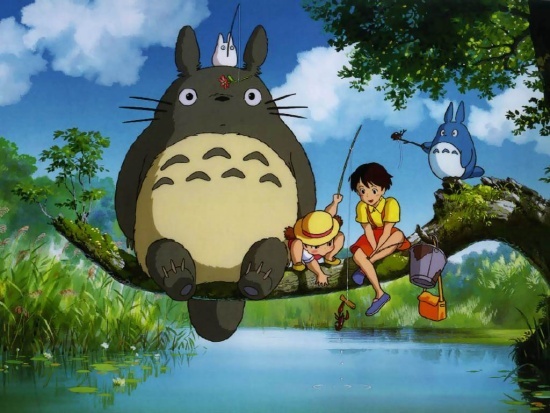 My Neighbor Totoro creates a world of beauty and whimsy instead of peril and dangers to be overcome, as do many children’s cartoons, inscrutably. The film is more about conveying the wonder of and promoting an appreciation for life than it is a means to tell a linear story; the provocation of a child’s senses of fascination and imagination is something that can never be overdone. This might very well be the greatest children’s movie ever made. I found it in the discount bin at Wal-Mart in my sophomore year of college—that was a big Wal-Mart year for me—bought it and watched it with one of my housemates: absolute GOLD. Milo is a cat, Otis is a pug, Dudley Moore is the comic genius who voices them, and pure, unadulterated glory is what they deliver. It has everything a kid needs: is a story, narration, dialogue, the works. But for kids who may get confused by plotlines or have trouble focusing on stories (I was one… I remember having no idea what the hell was going on in Aladdin), this movie is still enjoyable, thanks to the adorable animals exploring fascinating forests, teamed with funny exchanges in goofy voiceover. Mostly, it’s about friendship: one of the best values you can instill in a child. Through all their adventures, Milo and Otis never give up on each other. 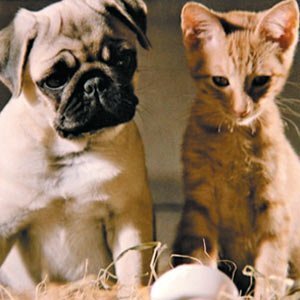 Despite an innate tendency toward enemyship between cats and dogs which has been propagandized via every cartoon ever made, Milo and Otis stick together, get each others’ backs, compliment one another’s characters, and prove to all audiences that there is some good in the world. And THAT is the kind of thing we all want our kids to believe. Probably. I wouldn’t know, I’m just an uncle. I know that everyone who reads this article will lament my overlooking of his or her childhood favorite. I’ve even left a few of my own preferences out: Toy Story, Homeward Bound, 101 Dalmations, The Muppets Movie, Brave Little Toaster, Platoon...we were all touched by different masterworks of cinema at early ages, so to each of us, there will be different Classic Childhood Movies. But we can all agree on one thing: Fantasia was freaky as hell.